Powers/Abilities: None, Kerfoot was a normal human, skilled in espionage and stealing of military secrets. 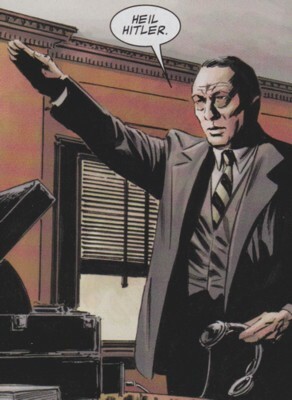 (Captain America I#155 (fb) - BTS) - Major Kerfoot was part of the German Schutzstaffel (the S.S., secret police). He also was a German spy. (Marvels Project#2 (fb) - BTS) - Kerfoot was sent to the US to infiltrate the military's scientific community as Professor Hamilton. (Marvels Project#3 (fb) - BTS) - Hamilton's background was checked by the US federal agencies and they deemed him a valuable addition for their robotics projects. (Marvels Project#2 - BTS) - Kerfoot had Phantom Bullet killed because he was snooping around at the docks, which the Fifth Columnists used to smuggle Nazi spies into the country. (Marvels Project#2) - Contacted by his superiors by long-range radio Kerfoot was informed of Erskine's defection to the US and ordered to monitor the situation and to report back when he heard more about the situation. His maid overheard Kerfoot giving a Hitler salute and Kerfoot strangled her to death when she tried to run away. (Marvels Project#3) - Hamilton was visited by General Kilroy, who told Hamilton he was needed on the staff for a new project. Hamilton happily agreed to serve his country. Kilroy replied that patriots like Hamilton would soon be needed more when the US joined the war. (Marvels Project#3 - BTS) - Investigating Phantom Bullet's death Angel (Thomas Halloway) learned that the Phantom Reported had busted up a smuggling ring, which presumably brought people illegally to the US. (Marvel Project#4 - BTS) - Kerfoot got his hands on the complete dossier on Operation: Rebirth's test subject Steve Rogers and stole it. He then gave it to Kruger. 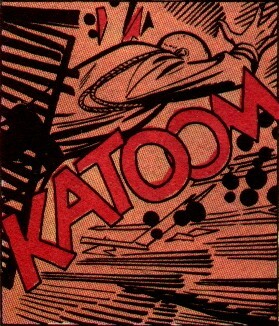 (Marvels Project#4) - At the beginning of fall 1940 Kerfoot met with Kruger in a dark alley in New York City. Kerfoot reminded Kruger to speak English, before handing over the credentials Kruger needed to attend Project: Rebirth's Super-Soldier experiment. Kerfoot told Kruger that he was only days away from getting his hands on Erskine's formula. Kruger would be free to murder Erskine as soon as Kerfoot had the formula. Their meeting was observed by the detective known as the Ferret, who was murdered by their handler. Kerfoot went through Ferret's pockets and found his investigation firm's business card. His handler sent Kerfoot back to the safe house because they couldn't risk any mistakes at this point. (Marvels Project#4 (fb) - BTS) - Kerfoot successfully copied Erskine's formula though he suspected parts were missing. (Marvels Project#5 (fb) - BTS) - Kerfoot fled his apartment only hours before government agents raided it after Kruger successfully assassinated Erskine and then died fighting newly transformed super-soldier Steve Rogers. (Captain America I#155 (fb)/Marvels Project#5 (fb) ) - Kerfoot wrote a report and included the Super-Soldier formula. The day after the experiment and Erskine's assassination Kerfoot faked his own death when he was seemingly killed by a car bomb. (Marvels Project#5 (fb) - BTS) - Kerfoot's report and the formula were sent to Berlin. (Marvels Project#5) - Even after faking his death Kerfoot couldn't find any sleep in his new safehouse. When his handler and two agents arrived at his door one day he let them in. His handler asked Kerfoot is he had copied the formula, but Kerfoot couldn't remember. He asked when he was going to return to Germany shortly before his handler broke his neck. His handler then ordered the other agents to get rid of his body and pack up his books, which should also be sent back to Germany including Kerfoot's Geheim-Akte. (Captain America I#155 (fb) - BTS) - Hundred of thousands of Nazi agents' reports were gathered in a huge storehouse in Germany by the allied. Kerfoot was believed to be an agent of lesser importance and his record remained there. (Captain America I#155 (fb)) - Between 1952 and the end of the Korean "War," the formula was found by the man who would become the Captain America of the 1950s (William Burnside). Comments: Created by Steve Englehart, Sal Buscema and Frank McLaughlin. It's rather strange that Kruger, a Gestapo agent, took orders by Kerfoot, a SS agent. Kerfoot's first name was revealed in Marvel Atlas#1. Profile by Spidermay. Update by Markus Raymond (Marvels Project). any other "Major" or character with a similar name.